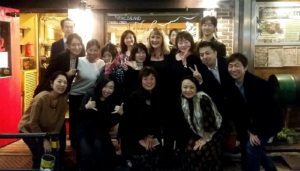 Misha recaps her recent trip to three cities in Asia. Packing bags and travelling to visit our markets Asia is something that Andy and I always look forward to and we usually go together but this time it was just me! The reality is to support all of our export markets with regular visits, it requires a lot of time out of the office. Now with our new Tasting Room which is open every day, as well as our older dog being over 12 years of age, (and preferring to be at home rather than staying in kennels, even if they are the luxury level), it’s making more sense for us to divide and conquer! So off I headed away for two busy weeks to visit distributors, retailers, restaurants and customers in some of our favourite places – Singapore, Hong Kong and Japan. It’s a tough gig but someone has to do it! Some of the PS Cafe guests. Heading to Singapore first– a city that was our home for seventeen years – is always wonderful and this time I had a little extra time in the schedule which enabled me to meet up with friends and enjoy some favourite Singapore dishes that I miss so much. Also, I was lucky that my visit coincided with Deepavali celebrations in Little India which made for a very colourful and entertaining evening with friends. 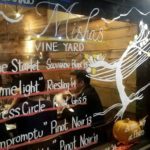 The first Misha’s Vineyard wine dinner on this visit was at PS Café at 38 Martin Road thanks to the lovely Sam Herde who heads the retail and beverage team. In the late 90’s when I was living in Singapore, one of my favourite haunts was the Blood Brothers Café which was located at the rear of a fashion shop called Project Shop in Paragon Shopping complex on Orchard Road. It was one of the only places you could get really good coffee, fantastic salads and great open sandwiches as well as an amazing array of cakes and tarts. It was ‘expat’ heaven! Over the years, the three founders of this original café have expanded and in early November opened their 8th PS Café outlet. 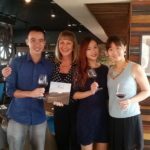 Little did I imagine in the late 90’s that some 20 years later the quirky café at the rear of that clothing store would have emerged to become one of the most successful café brands in Singapore and I’d be hosting a wine dinner at one of their outlets and presenting our own brand of wines! 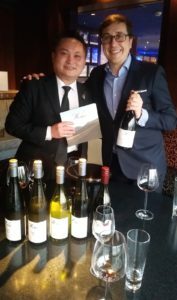 Over the next few days in Singapore I visited quite a few customers, did wine training with many restaurants listing our wines, as well as presented wines to potential new customers. These visits took me all over Singapore including to the Arab quarter which is now an up and coming hipster ‘hood with lots of trendy cafes, and to a Riverboat which is a replica of a Mississippi steam boat, which operates a restaurant, Gastrobar and function space. I also had the chance to do some training on our wine range with our wonderful distributor Crystal Wines, with whom we’re celebrating our seventh year of partnership and friendship. 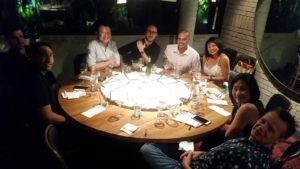 The final night of activities in Singapore was at the luxurious Mandarin Oriental Hotel hosting another wine dinner. Our Misha’s Vineyard “The Starlet” Sauvignon Blanc was chosen as the premium Sauvignon Blanc to be served by-the-glass at the prestigious hotel after going through quite a selection process. 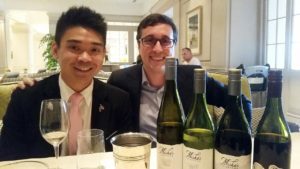 Hotels like the Mandarin Oriental put so much effort into choosing by-the-glass selections; sometimes the wines are from the great global brands, sometimes they’re from limited volume boutique family-owned wineries, but always, they are great wines! 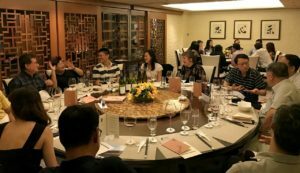 We had committed to the hotel many months back to host a wine dinner in their beautiful Cherry Garden Cantonese restaurant. It’s amazing but I think the matches that the hotel came up on this night for our wines, were some of the most perfect food and wine combinations I’ve tried. But then, you wouldn’t expect anything less than perfection from a brand like the Mandarin Oriental and the incredible attention of their Sommelier Inthran Ramasamy. After Singapore, I headed toward the bright lights of Hong Kong and to Clearwater Bay – a rural peninsula in Sai Kung area which is on the eastern tip of the New Territories and becoming a favoured area to live for those looking for alternatives to high-rise apartment living. It’s here that speciality food and wine grocer, Feather & Bone, have set up another store – in fact their Flagship store. We held their first ever wine tasting evening here which was a lot of fun and I made some great friendships as locals came in to try our wines and enjoyed a lovely selection of cheese and charcuterie. Other visits in Hong Kong were mainly the large 5-star hotels that we regularly work with including The Peninsula Hotel where we also had an amazing lunch before doing a tasting with Sommelier Mike Liu, and the Sheraton Hong Kong Hotel & Towers in Kowloon, which has the most superb oyster and wine bar on the top floor of the hotel where we tasted through our range of wines with ever-smiling Roger Fan, Hotel Sommelier. 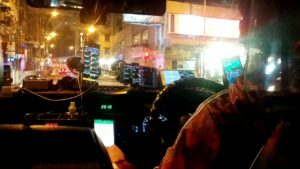 HK Taxi – 5 phones at once – and the traffic! Back on Hong Kong Island it was a treat to have lunch at Fishteria who love our unique Sauvignon Blanc and have been serving it at the restaurant for some time. Visiting Hong Kong is always a buzz and I’m always struck by their adoption of the latest technologies but on this visit, I was amazed the sheer number of phone screens that cab drivers felt they needed. In one of the cabs I was in, there were there were no less than 5 phone screens flashing in front of the driver, almost competing with the outside view of flashing lights and the neon of downtown Hong Kong. In an effort to fit in as much as possible, I checked out of my Hong Kong hotel at 11.30pm to head the airport in order to catch a 2.30am flight to Tokyo – in retrospect not my best scheduling decision! Arriving in Japan just before 8am, my very long day in Tokyo was about to start! 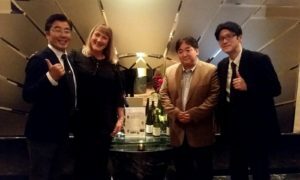 Accompanied by the lovely Saito-san, from our importer Apurevu Wines, we rushed all over Tokyo visiting customers as diverse as boutique wine shops in privileged Azabu-Juban area, to the large department store of Matusya in the ritzy Ginza, and to some New Zealand themed restaurants and bars like the new Zealander restaurant, Arossa and seeing old friends Sara and Tomoki at NZ Bar. We finished my very long day, with a wine dinner at Ebizo with a New Zealand inspired degustation menu. We had so many fans of our wines at the dinner and it was a lot of fun, but by 11pm, completely exhausted from virtually no sleep the night before, it was a fast exit and back to my ‘capsule-like’ room in Hakozaki – which despite its tiny room size, is at least walking distance to our distributor’s office so very convenient. 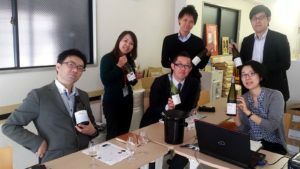 My final day in Tokyo started with some updated training on Misha’s Vineyard wines for the sales team of our distributor, then off around town for more tastings and meetings. 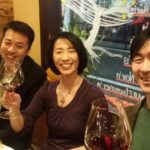 I was really looking forward to the final night in Tokyo which required a train ride to Yokohama where I met Yoshitake-san who heads up operations for our distributor. We went to the Yokohama Bay Sheraton Hotel and Towers and as it turned out, my visit coincided with a Fresh Market promotion that NZTE (our government trade organisation) had organised with the hotel, so they were serving a New Zealand degustation dinner with two Misha’s Vineyard wines offered by the glass. It was exciting to be at the hotel during their New Zealand promotion and it seems they were excited too as the hotel General Manager met us on arrival with a team of PR and marketing folks! After photos with everyone in every different combination, we settled down to sample the New Zealand degustation dinner. However, as guests arrived for the New Zealand, we were invited to greet them and tell them about New Zealand and thank them for selecting the New Zealand menu and wines, so for the first hour, we were jumping up and down from our seats every few minutes! Things settled down after a while, and then Yoshitake-san and I really enjoyed the evening as we dined overlooking Yokohama Bay from our skyline dining location. What a visit to Asia! Am I ready to visit again – can’t wait!